Ivanna Kozii discusses her honey bee research. Photo by WCVM Today. 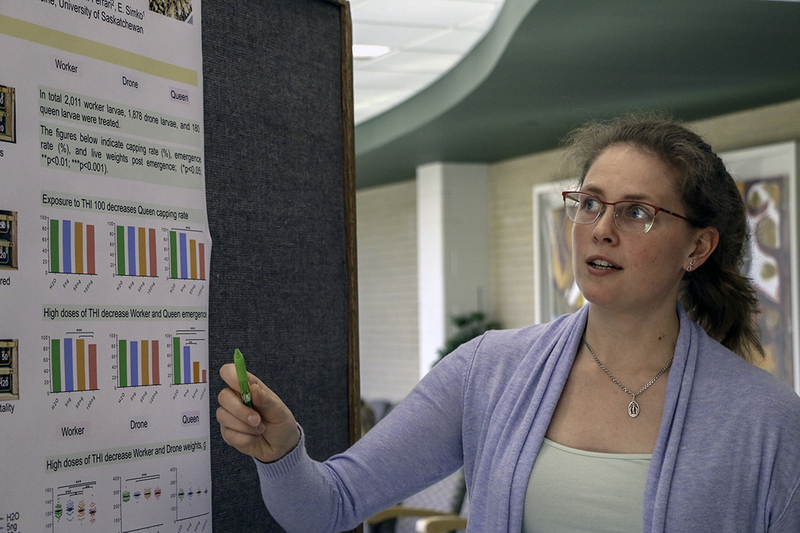 The annual Graduate Student Poster Competition was held at the WCVM on Mar. 21. During the event, 43 students shared their findings with their colleagues as well as faculty and staff. The researchers also answered questions from a team of judges who gave out a total of 10 awards in three categories. First place winners received $200, second place $150 and third place $100. The award winners were recognized at an event following the competition. This was also a chance for the WCVM’s Graduate Student Association (GSA) to announce their student of merit awards, which recognize three remarkable students at the WCVM. Students were judged for their academic excellence, research excellence, professional development and leadership skills. In addition, Dr. Vikram Misra was recognized for excellence as a graduate student supervisor and Dr. Sarah Wood for best paper. These new awards were created in 2018 and were determined by a committee. First place: Mengying Liu, Veterinary Pathology (supervisor: Susantha Gomis). Research title: Variant Infectious Bursal Disease Virus (varIBDV) - SK09: A Potential Vaccine Candidate to Control IBDV Infection in Canada. Second place: Maodong Zhang, Veterinary Pathology (supervisor: Yanyun Huang). Research title: Respiratory viruses identified in western Canadian beef cattle by metagenomic sequencing and their association with bovine respiratory disease. First place: Pauline Guidoni, Large Animal Clinical Sciences (supervisor: John Harding). Research title: Characterization of tight junction proteins in the maternal-fetal interface of porcine placenta. Second place: Ivanna Kozii, Veterinary Pathology (supervisor: Elemir Simko). Research title: Are all Honey bee castes affected equally by exposure to Thiamethoxam during late larval development? Second place: Sarah Wood, Veterinary Pathology (supervisor: Elemir Simko). Research title: Chronic high dose neonicotinoid exposure decreases overwinter survival of honey bees (Apis mellifera). Third place: Asha Perera, Veterinary Pathology (supervisor C. Soos and K. Machin). Research title: NMR-based metabolomics: a novel tool to study stress in wild birds? First place: Mariia Tokareva, Large Animal Clinical Sciences (supervisor: Yolande Seddon). Research title: A comparison of motivation for exercise and food in stall-house sows and gilts. Second place: Priscila Curso-Almeida, Veterinary Biomedical Sciences (supervisor: Lynn Weber). Research title: Investigating the health benefits of a yeast-fermented pet food. Third place: Breanne Murray, Veterinary Biomedical Sciences (supervisor: Karen Machin). The effects of pre-hatching elevated corticosterone and post-hatching restrictive food availability on the HPA axis development of mallard ducks (Anas platyrhynchos).